»Culture & Arts»Don’t Forget! Tomorrow – Galway Pride Club GASS Pride Spectacular At The Róisin Dubh Sat. August 18th! Don’t forget the fabulous Galway Pride Spectacular tomorrow, Saturday 18th August, at Club GASS Galway! The one you’ve all been waiting for!! 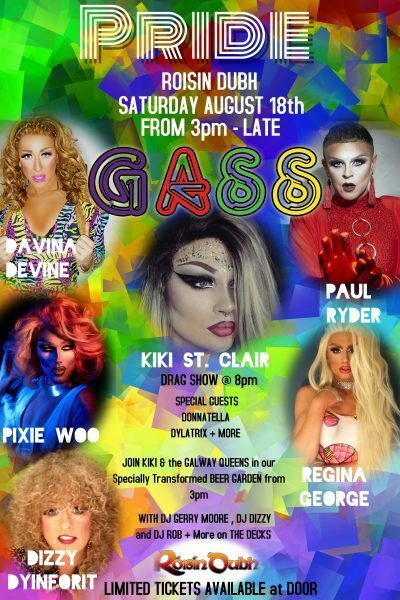 The lovely Kiki St Clair hosts the largest-ever Club GASS Pride Party, from 3pm till late, at the Róisín Dubh, Dominick Street in Galway, tomorrow Saturday August 18th – 10 Drag Queens, 5 DJs, 4 Bars, 3 Floors, 1 incredible party! Club GASS is Galway’s longest-running LGBT night, renowned for its fantastic Drag displays, stomping disco hits, and the most up-for-it crowd in town. The action kicks off at 3pm in the specially transformed Pride Beer Garden. Join your host Kiki St Clair on the decks, with special performances from the amazing Galway Queens. Meanwhile, DJ Gerry Moore takes to the decks in the upstairs club, blasting out the golden oldies. The party then heats up at 8pm, as Kiki, Davina, Paul, Pixie, Dizzy, Regina, Dylatrix (and many more!) ignite the Club GASS stage with an extravaganza of extraordinary Drag. Later in the night, DJ Rob is downstairs to host a glittering UV Party, while upstairs DJ Dizzy & guests belt out the best gay floor-fillers for prancing and dancing on the gayest night of the year! This is all happening tomorrow, Saturday 18th August, at the Róisín Dubh, Dominick Street in Galway, so don’t miss this year’s most fabulous Club GASS Pride Spectacular 2018!